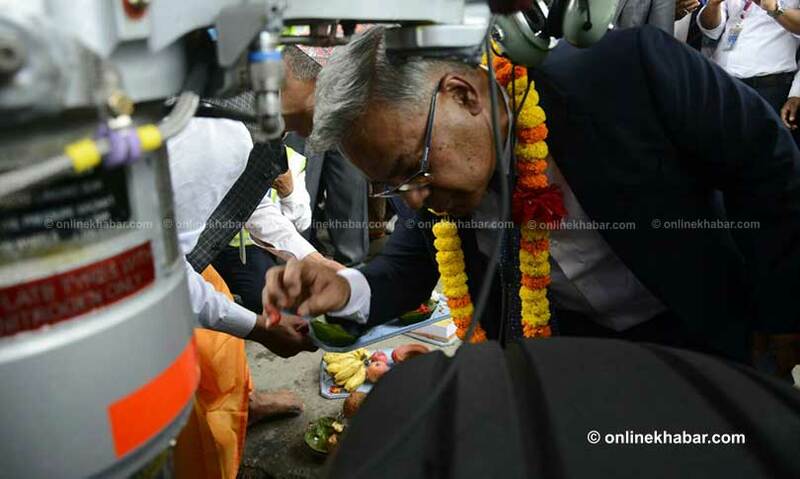 NAC Managing Director Sugat Ratna Kansakar worships a new wide body aircraft as it lands at TIA in June 2018. Members of the Public Accounts Committee in Parliament have demanded that the government immediately launch an investigation into the suspected irregularities in the purchase of two wide body aircraft for the national flag carrier, Nepal Airlines Corporation. Criticising Minister for Civil Aviation Rabindra Adhikari for his failure to take action, they also demanded that the Corporation’s Managing Director Sugar Ratna Kansakar resign. If he fails to quit, the government should sack him, according to the parliamentarians. Speaking at a meeting of the Committee in Kathmandu on Wednesday, lawmaker of the ruling Nepal Communist Party, Bishal Bhattarai, demanded that Kansakar resign as the Office of the Auditor General had also accused him of irregularities. Likewise, lawmaker Prem Aale said irregularities were evident as the Corporation purchased the aircraft through an agent though it could procure them directly. Lawmaker Birodh Khatiwada questioned why the government did not have any business plan for the expensive aeroplanes.